Following on from Miley's recent debut on the blog, we are both back today to review this awesome hamper of treats kindly sent to us by Aldi to try out and share with you. 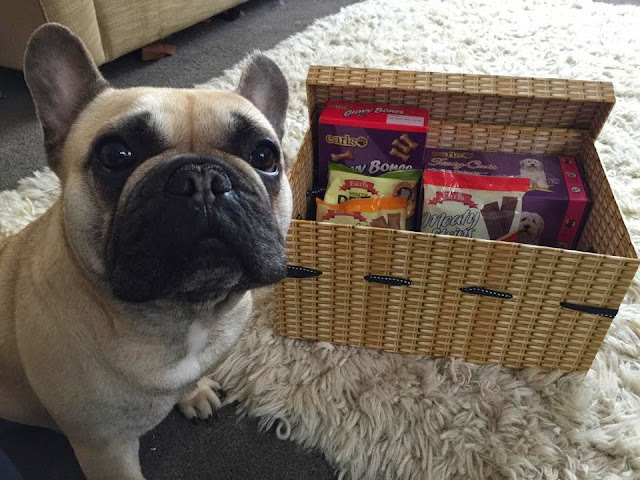 The hamper contains a mixture of wet foods and treats, all at a fantastic budget price and easily accessible in your nearest Aldi store. As you can see Miley was super excited when our delivery arrived, this is her "What's this" expression. I put out a taster plate of a few treats for the four of them to enjoy (all of these for Miley would be a little excessive!!). Within seconds they were all snatched and ran off with and quickly gobbled up. I'd say their favourites were the meaty strips which are a much cheaper substitute for the ones I usually give them so 100% something I will purchase in the future. She then had a go at the meaty chunks which I thought were good, a really high ratio of meat vs jelly as sometimes with cheaper options you find the opposite so I was suitably impressed. As was this little lady! We also tried out the gravy pouches, which I would say were more Sadie's favourite, Miley was very biased towards the meaty chunks above but I think it's just personal preference. The four of them all sway either towards the gravy consistency or the jelly and I can safely say that all of the products we tried went down a storm across my four little judges. I am really happy with everything in the hamper and if you want to try out any items for your own dogs you can view the full list of products in the range here. You can also find your nearest store using this Store Locator. I hope you enjoyed this post and leave me a comment below if you want to see more pet themed posts. Look so good! My dog would love this.